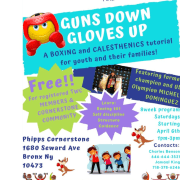 We are offering free boxing and basic cardio tutoring for youth and their families specifically grandparents to help bridge the gaps, promote self discipline, build self esteem and provide structure. Vokunteers needed to work with boxing coach to help kids follow the instruction. A volunteer is needed to sign people in. A volunteer is needed to manage this 8 week every sat program. A volunteer is needed to do marketing as well as outreach to possible donors.